Salisbury will become the first entire city in the country to gain access to Openreach’s new, future-proof Fibre-to-the-Premises (FTTP) broadband technology, in what is expected to be the fastest city-wide network build in the UK. Chancellor of the Exchequer, Philip Hammond, said: “The Chancellor of the Exchequer, Philip Hammond said:“The growing speed with which we connect online with our families, friends and work colleagues, not only brings us closer together, but it also provides huge benefits for our economy. Clive Selley, CEO at Openreach, said: “Salisbury has a unique and inspiring history - from its medieval sites to its thriving cultural sector, it’s an icon of our national heritage – and now we’re laying the foundations for an even more exciting future. The city will be a focal point of our ambition to future proof the UK’s digital infrastructure and boost the country’s economic growth and productivity. Rich Lloyd, Director of serious games development company Blueflame Digital said, “Having fibre connectivity will be a game changer. Reliable broadband is an essential tool for any business, and we wouldn’t survive without the internet – it impacts every aspect from the way we communicate as a team to how we handle our clients and projects.The benefits of fibre broadband will mean that we can directly compete with places like London, without any of the challenges that businesses in inner cities face. Fibre will be a boost for all the businesses based here in Salisbury, and for me personally, it means that I can run a world-class business and raise my family in the countryside at the same time”. Salisbury-based business the British Shoe Company has 45 years of experience in shoe manufacture, repairs and sales.Owner John Carney Snr made the decision to relocate to the heart of the cathedral city five years ago, with the quintessential Englishness of the Salisbury a perfect fit for the business’s target audience of locals and tourists.But poor connectivity is holding the business back, meaning it struggles to meet the increasing demands on its website causing frustration. Director John Carney Jnr says, “We are losing around 2 to 3 hours a day from a combination of the internet crashing and being extremely slow.This has a direct effect on our productivity both in-store and online which has a dramatic effect on our company turnover.With around 600 different shoe styles, we are constantly making changes and need to stay ahead of the trend.With improved connectivity, I believe our overall ability to compete both in the UK and around the world will be drastically improved”. And Poppy’s Picnic, an award-winning young company in the heart of Wiltshire is crediting the arrival of full fibre for revolutionizing its business.The company manufactures fresh, raw pet food and now benefits from some of the fastest and most resilient broadband speeds in the country.It originally relied on expensive and unreliable mobile broadband dongles, which were not conducive for a business hoping to expand its retail order capabilities in the UK and overseas. Since the fibre technology was made available in 2018 through the BDUK programme, the business has run more efficiently with virtual training sessions for staff, collaborative working via the cloud in real time and uninterrupted video calls with suppliers in London and Asia, reducing stress and saving time and money once spent on expensive travel. Founder Dylan Watkins said, “Right from the point of installation, we were able to process orders in seconds rather than 15 minutes, handle simultaneous customer calls online and by phone, and gone are the days of intermittent connection when video-calling potential investors.As a young business, to stay competitive we need to give customers a high level of service and fibre has propelled us forward.In just three months, we’ve seen an increase in our customer satisfaction ratings and our team is much more motivated”. Innovate Product Design specialises in helping inventors patent, prototype and commercialise their new product ideas.It’s based in Salisbury and has thirty employees and satellite offices in London, Paris and San Francisco.Managing Director, Alastair Swanwick said, “Full fibre will greatly improve communication tools, such as video conferencing, to accelerate the expansion of our business overseas.In addition, it will revolutionise the time it takes to complete a project, with the heavy-duty 3D CAD processing being outsourced to the cloud.We will be able to offer a world-class service while enjoying the Salisbury city life and beautiful surrounding countryside”. Openreach is recruiting 3,000 new trainee engineers across the UK– including 24 new roles in Salisbury – to support its network plans, whilst Salisbury joins 25 other locations across the UK that make up the first phase of Openreach’s multi-million pound ‘Fibre First’ programme, which will initially connect three million homes and businesses by the end of 2020. The business is also creating 12 new and upgraded regional training facilities for engineers, with two up-and-running already in Bradford and Peterborough. Many of these centres feature a unique ‘Open Street’ environment – a meticulously designed mock-up of a typical suburban street which gives recruits the opportunity to develop and enhance their skills in an authentic, immersive yet controlled environment. Among the 12 facilities being built and upgraded are two training centres in Nursling and Swindon, which will receive £730,000 worth of investment in total. Nursling will benefit from its own ‘Open Street’, while two new classrooms and a specialised fibre training facility are planned for the centre in Swindon. 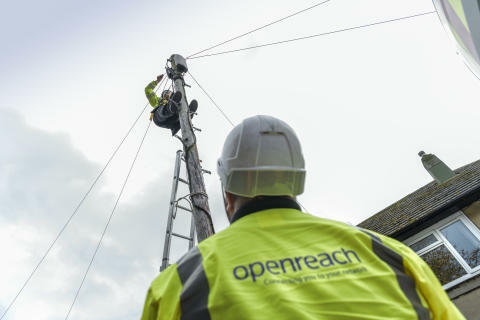 Openreach’s ambition is to build FTTP to around 10 million premises by the mid-2020s and ultimately to the majority of the UK under the right conditions. By the end of 2018, Openreach had made full fibre broadband technology available to around 900,000 homes and businesses nationwide. To ensure the community is kept up-to-date on the project’s progress, Openreach will provide updates ahead of each Salisbury City Council meeting, with the first due to take place on Saturday 18th May. The benefits of Openreach’s full fibre technology will also be a boost for Salisbury’s education, health and social care facilities. For schools, colleges and universities, an FTTP connection can unlock opportunities for online learning; the streaming of lessons and lectures without interruption; and the use of portals for communicating with classmates or teachers, and submitting work. For GP surgeries, full fibre can enable faster, more reliable on-demand services, such as remote doctors’ appointments and check-ups, plus more efficient, reliable access to online information and records. Meanwhile for care homes, it can mean a 24/7 connection between residents and their loved ones, as well as activities and entertainment, from catch-up TV to online puzzles and e-books. Kevin Brady, HR Director at Openreach, said: “We’re getting on with building full fibre broadband for the entire city of Salisbury, and we’ll need skilled, dedicated engineers to get the job done. Enquiries about this story can be made to the Openreach PR team on 020 7809 7950 or email; press@openreach.co.uk. All news releases can be accessed on our web site. Full fibre connections will provide speeds of up to 1Gbps, about 20 times faster than the current UK average of 46.2Mbps – enough for a Salisbury family to stream 200 HD movies all at the same time. Openreach has a dedicated First First section of its website with lots of information about our full fibre build programme, including a short video which explains what Full Fibre technology is. The company is hiring 6,500 apprentice engineers in every corner of the country over two years to support its ‘full fibre’ broadband build plans. It is currently looking for 3,000 new recruits, having filled 3,500 such roles in 2018. Out of the 6,500 total, 3,600 are net hires, having taken account of attrition (e.g. retirement).